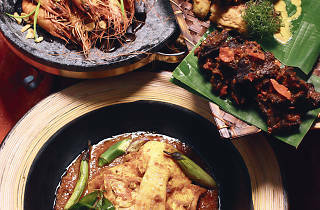 ‘Kampung in the City’ is the theme for both of KLCC’s buffet menus, Al-Mubarak and Al-Kareem. Feast on kampung-style signature dishes like ayam panggang percik gula kabung, dendeng goreng berlada, ikan pari assam pedas and udang goreng with kuah pedas kicap manis. Meanwhile, there will also be live action stations featuring Malaysian staples like mee curry Nyonya, Hainanese chicken rice, mee goreng mamak and Penang char kuay teow. Wrap up your meal at the ‘Goreng Gorengan’ station for fruit fritters and seafood crackers, or raid the dessert bar for serawa durian, local kuih, dates, cakes and more. This year, however, the organisers are only making the spread available for private banquets of 100 guests or above.